Surprisingly, we got another nice bit of press in recently. Huffpost Finds wrote up a short post last week on "The Best Sites For Affordable Mid-Century Modern Furniture And Decor, In One Exhaustive List" and A La Modern got mentioned! This press came out of nowhwere and was a bit of a surprise (thanks Francine for the tip-off! ), especially because this best-of list of 28 different sites for buying quality and inexpensive mid-century modern furniture and home decor included a lot of bigger names like Chairish, One Kings Lane and Design within Reach. I suspect that they purposely mixed in some of the smaller Etsy shops, but regardless it was certainly a nice thing for them to do. 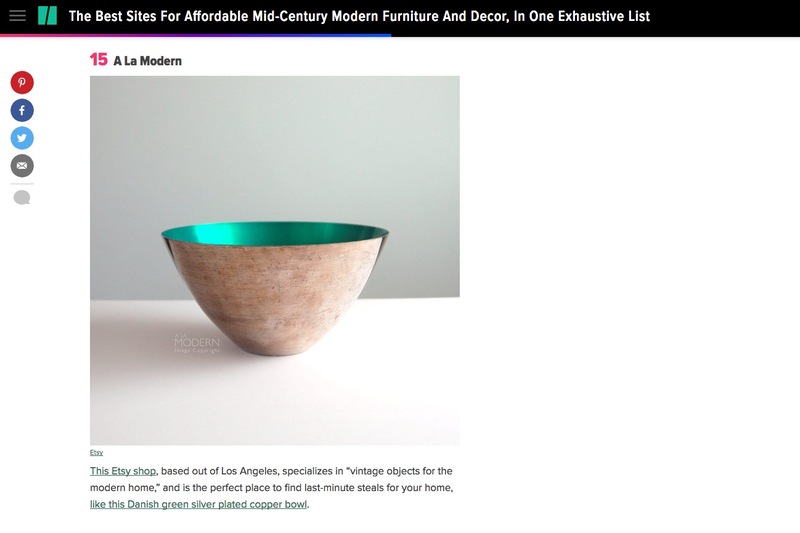 The item from our Etsy shop that they featured was this E. Dragsted modern green bowl which sold out the day that the article came out, but we didn't find out about the mention until the weekend. Very appreciative that they picked us, however, and it definitely gave us a welcome spike in traffic and sales during these summer month selling doldrums. I'd better get cracking on listing more items to take advantage of any traffic coming in. Here's hoping we get some more press like this!